Labels: anthopologie candle, anthropologie wish list, coffee candle, fashion, latte candle, oxblood satchel, tinted lip treatment, wanderlust globe anthropologie. Categories: anthopologie candle, anthropologie wish list, coffee candle, fashion, latte candle, oxblood satchel, tinted lip treatment, wanderlust globe anthropologie. All these peices look stunning, i want them all too! I love the garland and the globe, so cute! Love the lip treatment and the bag! 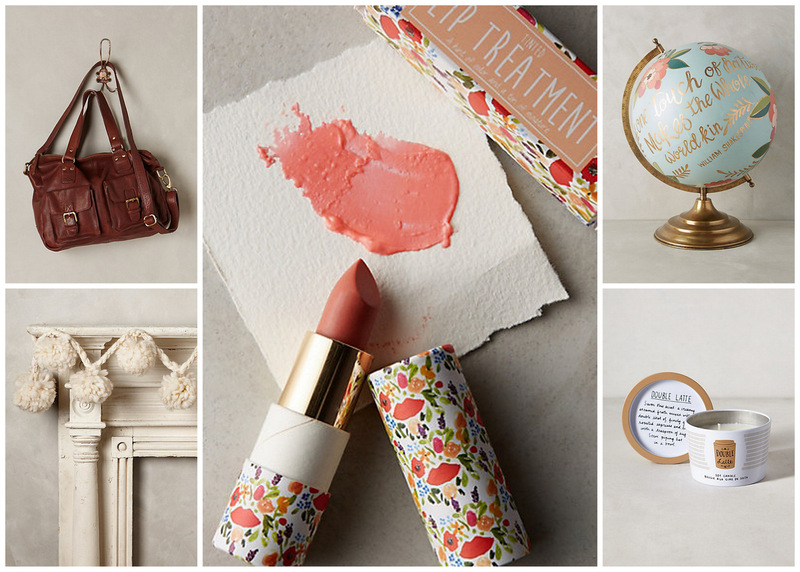 How pretty is that lip treatment packaging?! I know it's not a reason to buy something but still, so prettttyyyyyy! Ahhh I LOVE that globe! I want oneeeeee! Ohh I need it all!! Every since last Christmas, I have developed a love for Anthropologie! I bought the cutest blue and white polka dot bowl from them last year, and I have been using it faithfully ever since. I would seriously decorate my whole house in their beautiful items if you wallet would allow.